Likewise, I think that the simple “asks $5 donation per autograph” doesn’t tell the whole story. 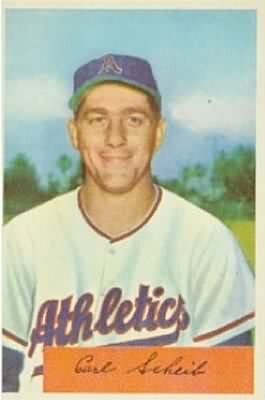 I sought out Carl Scheib, who became the youngest player in American League history when he debuted in Philadelphia in 1943 as a 16-year-old hurler. Is the donation request to discourage autograph requests? For any player of Scheib’s era, consider how much — or little — they made in their careers. I asked what his top salary was. If that’s not enough to get your envelopes ready, Scheib mentioned that any time someone sends him a donation, he tries to include an extra signed card in the reply. A great illustrated history of Scheib’s life and career can be found at the encyclopedic Philadelphia Athletics Historical Society website.